The Midtown Tulsa area is one in which the great outdoors offers more than enough for its residents. If you're a pet lover looking to find the perfect spot for you and your pooch, or if you're just looking for a place to spend some time away of your apartment to engage in some outdoor recreation, we have the perfect place just for you that's just moments away from your community. There are so many things to do along the Riverside area of Tulsa. From walking & biking trails to fishing & water sports, you are sure to find the perfect outdoor opportunity for you and your friends. The stretch of pedestrian and cycling lanes makeup nearly 9 miles, from 11th Street all the way up to 101st Street near Jenks. These relatively flat, hard surface trails make fitness at any level most accessible. Riverside is also known for its vast collection of bronze wildlife sculpture artwork. These pieces are a symbol of wildlife preservation projects in the state of Oklahoma. Some of these pieces include Riverside Mallards by Ronnie Wells, American Bison by Stephen LeBlanc, Arkansas River Otters by Robert Ball, and Wichita Wapiti by Jocelyn Russell. You will also find additional pieces of artwork that portray character studies like Crossing the Prairie and The Web. For the more active outdoors folks in Midtown Tulsa, fishing, rowing and kayaking are also great options around the Riverside area. For more information, visit the River Parks Authority website. The Woodward Park area that rests at the corner of 21st and Peoria is a 45-acre beauty. 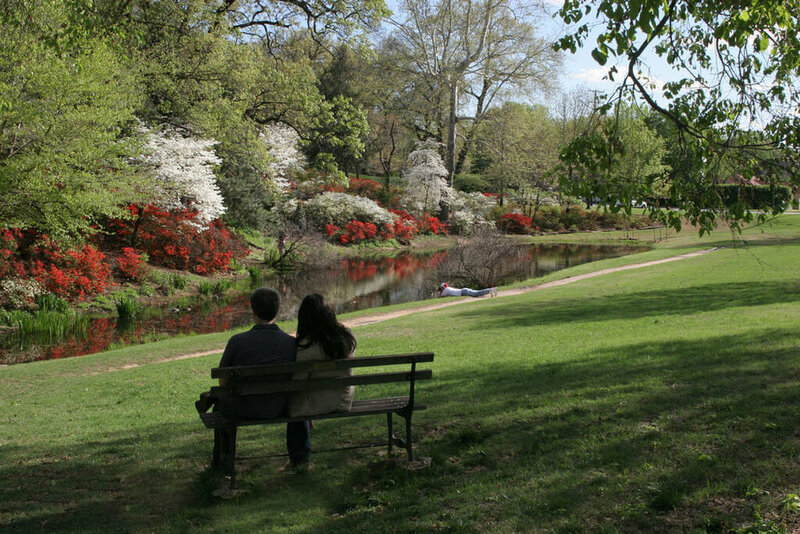 This public park offers a botanic garden and arboretum that was carefully crafted to offer visitors a breathtaking horticulture experience. Complete with tropical plants, spring flowers, and many more offerings, this setting is particularly popular for photo shoots and Sunday afternoon sightseeing. The Tulsa Rose Garden was established in the mid-1930s and is home to over 9500 roses in nearly 300 varieties. Better Homes and Garden even presented the Tulsa Garden Club with an honorary achievement award for the successful effort. This is a picturesque setting that you won't want to miss - perfect for all four seasons. For more information, visit the Tulsa Garden Center online. For those closer to the downtown area, check out Centennial Park off 6th Street near the Meadow Gold District. Sweeping views of the downtown skyline, perfectly engineered hiking trails, and dog & pet areas perfect for your K9 companion. The fall and springtime seasons are especially popular for photo opportunities. The park is home to many families of birds, turtles, rabbits, and more. Come and join Tulsa's wildlife in its natural habitat.